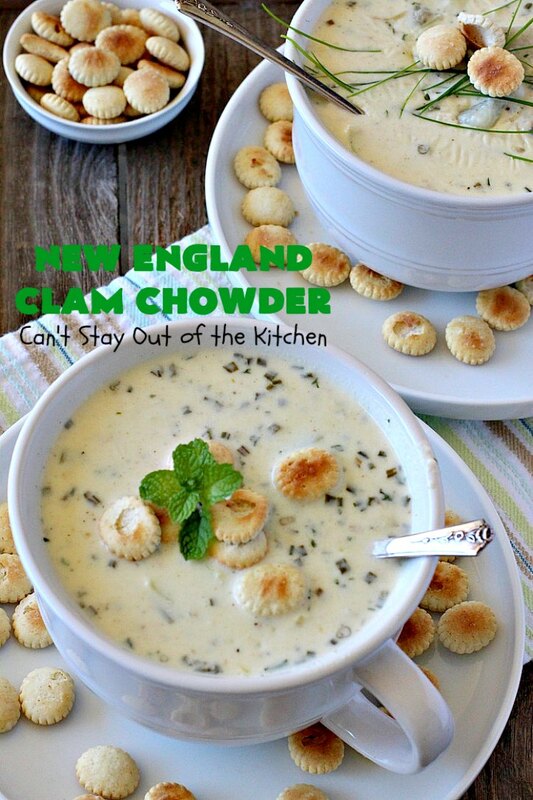 New England Clam Chowder is awesome! 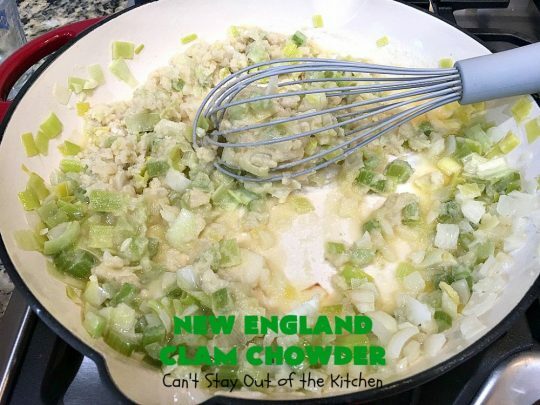 It’s chocked full of minced clams, red potatoes, celery, leeks, onions and garlic in a rich, creamy sauce seasoned to perfection. I prefer my chowders thick, and this one is nice and thick, It’s made with heavy whipping cream and half-and-half. 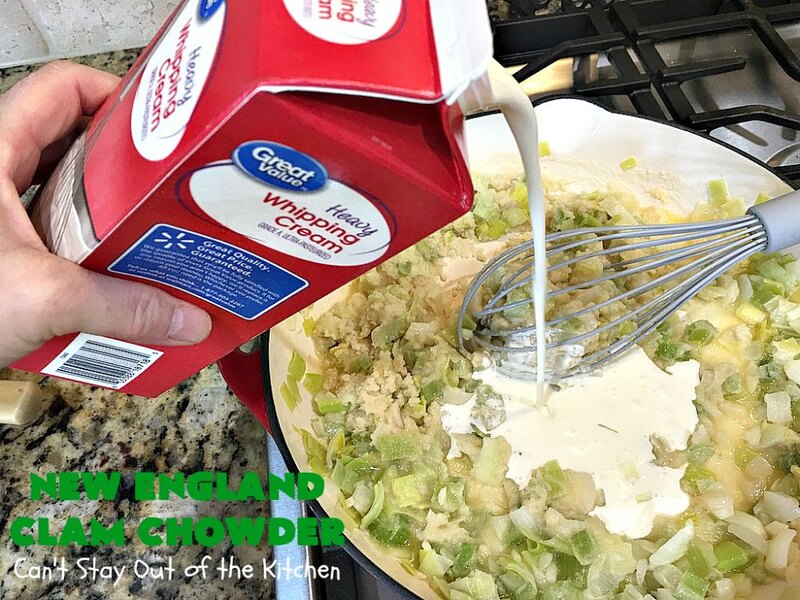 In fact, if you reheat this the next day you will have to add a little milk or half-and-half to thin it a little as it thickens after refrigeration. 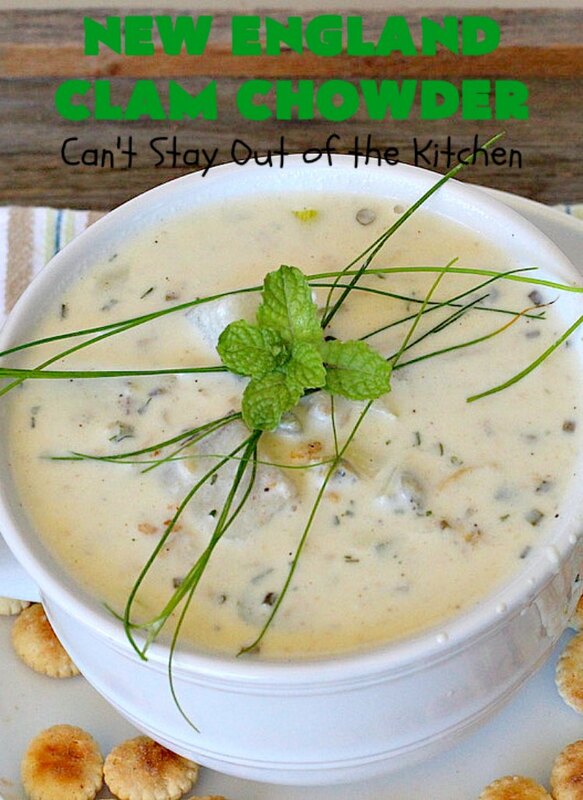 My New England Clam Chowder creation is a clean eating recipe along with being gluten free. But, it is by no means low in calories. If you’re worried about calories this is not the recipe for you. It’s made with a quart of cream and a quart of half-and-half which help provide the great texture and prevent the chowder from breaking down when heated as 2% milk will do. No, this one stays creamy and holds its consistency. Back in the 90s, our family lived in New England. 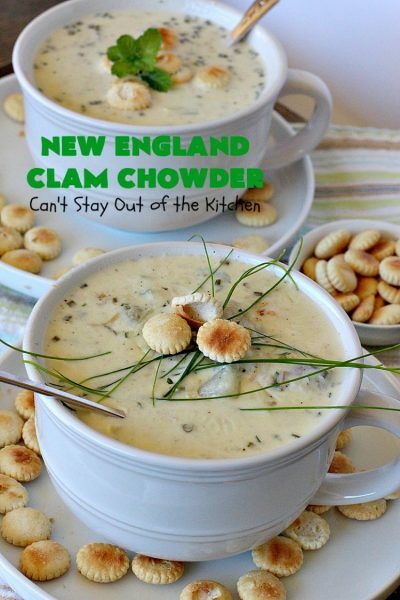 We had the opportunity to eat a lot of New England-style Clam Chowder as it was always on restaurant menus there. 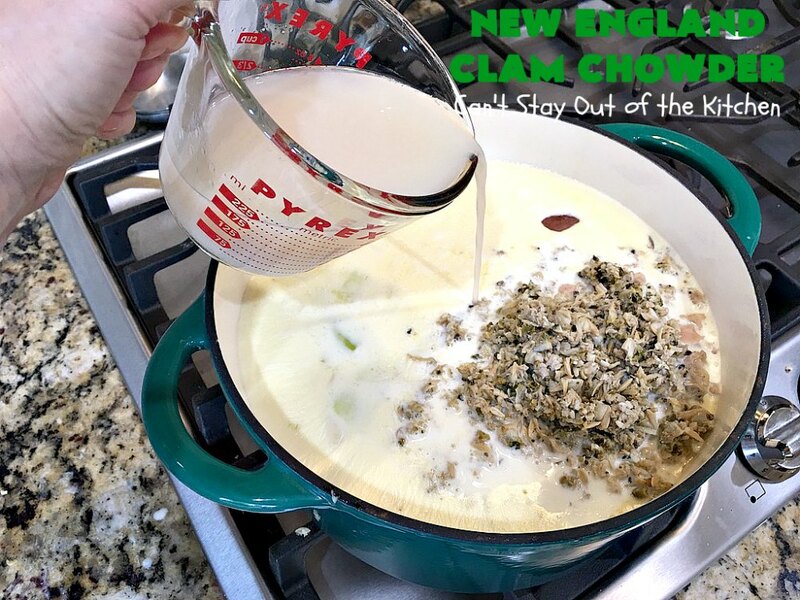 I decided to try to recreate a chowder that was close to those I sampled in the area. After a few tries, this is what I came up with. We LOVE the taste. In fact, we had a few families from our church over for dinner last Sunday and New England Clam Chowder was on the menu. Everyone raved over it. It is really tasty and this recipe makes a lot. Cut the recipe in half if you have a small family, or if you don’t want leftovers. Actually, we love having the leftovers, but there was only about 3/4 cup leftover for my lunch the next day after all of us had eaten our share on Sunday! Most of us had two bowls! If you’re looking for a wonderful New England-style Clam Chowder recipe, then I can highly recommend this great chowder. This recipe actually won a contest at a church we were in out of about 50 different entries. 🙂 It really is amazing and great comfort food on cold winter nights. Enjoy. I initially posted this recipe in January 2014. My pictures seemed to lack life and zest. I was still relatively new at taking pictures with my Canon camera. I decided to remake the recipe (October 2018) for our Friday night Bible study group. Without exception, everyone loved the soup. It truly is one of the best soup recipes I make and certainly terrific for fall or winter when you’re in the mood for comfort food. I kept the recipe gluten free. Traditionally, however, this soup is served with Oyster Crackers. So you can make this gluten free, or NOT, depending on your family’s needs and preferences. This thick chowder is loaded with clams, baby red potatoes, onions, garlic, leeks and celery. 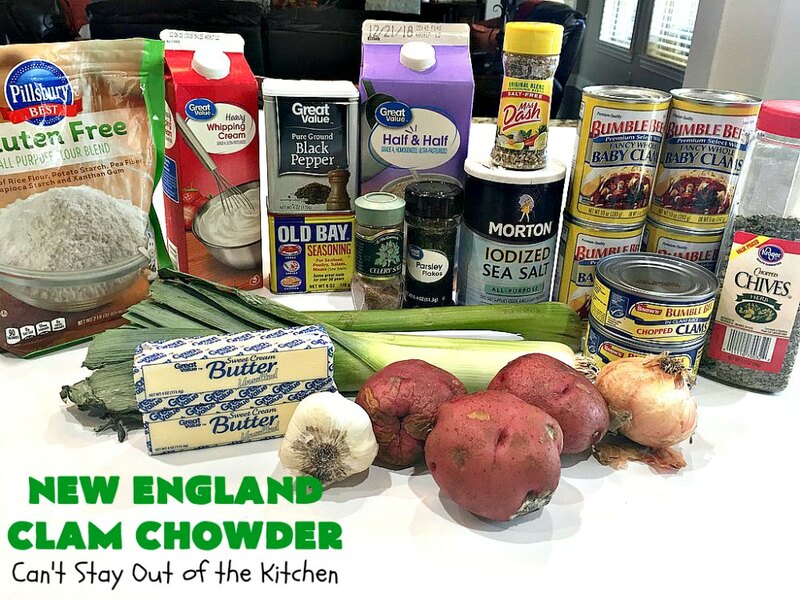 Seasoning New England Clam Chowder with Old Bay Seasoning, Mrs. Dash Seasoning, celery salt, parsley, and chives does the trick! Wash and chunk the potatoes. Parboil the potatoes in water until just barely fork-tender. Don’t overcook the potatoes to the stage of mushiness, or the texture for the soup will be ruined. Drain and set aside. Saute celery, garlic, onions and leek in butter in a large Dutch Oven. Any kind of onions will work. You can also use shallots or green onions. Don’t omit the leek if you want the full flavor of this great chowder. Add gluten free flour. If you’re not gluten intolerant, any all-purpose flour will work. Whisk the flour into the veggie mixture. Add the cream. I usually add about 1/8 cup at a time until all is incorporated. Add a quart of cream. Add the half-and-half. You will need to add 3-4 cups of half-and-half. This is based on your preference for thickness. Add salt, pepper, celery, salt, chives, parsley, Mrs. Dash and Old Bay Seasoning. Mince clams. (I was only able to find one can of minced clams. I had to use whole clams that I chopped/minced for this recipe). Add minced clams to chowder mixture. Add some of the reserved clam juice/liquid. This is a preference issue. Start with 1/2 cup. If you want your chowder more clammy tasting add a little bit more. Stir all ingredients to combine. Cover with lid and allow soup to heat through over low to medium heat about 20 minutes or so. Come and get it! 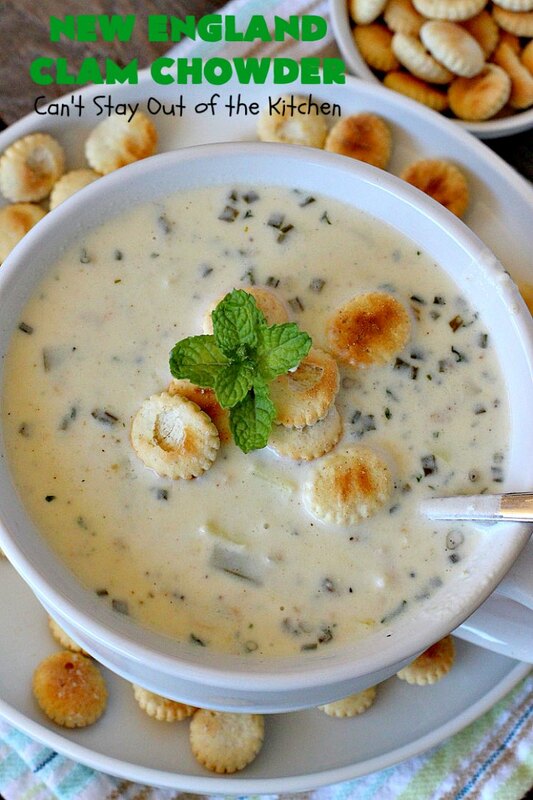 New England Clam Chowder is ready to eat. We’ve always served New England Clam Chowder with oyster crackers. I also served it with bread. 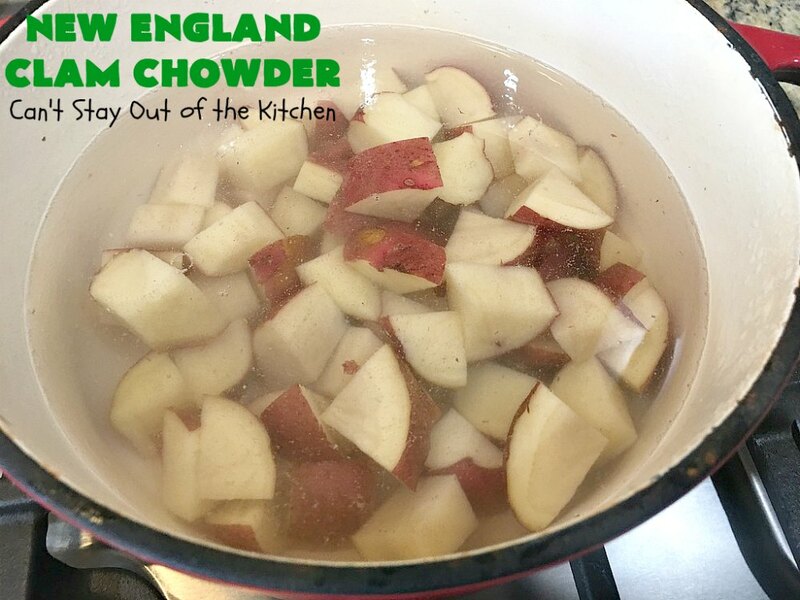 New England Clam Chowder is different from Manhattan Clam Chowder. Manhattan Clam Chowder is made from tomatoes and has a tomato base. 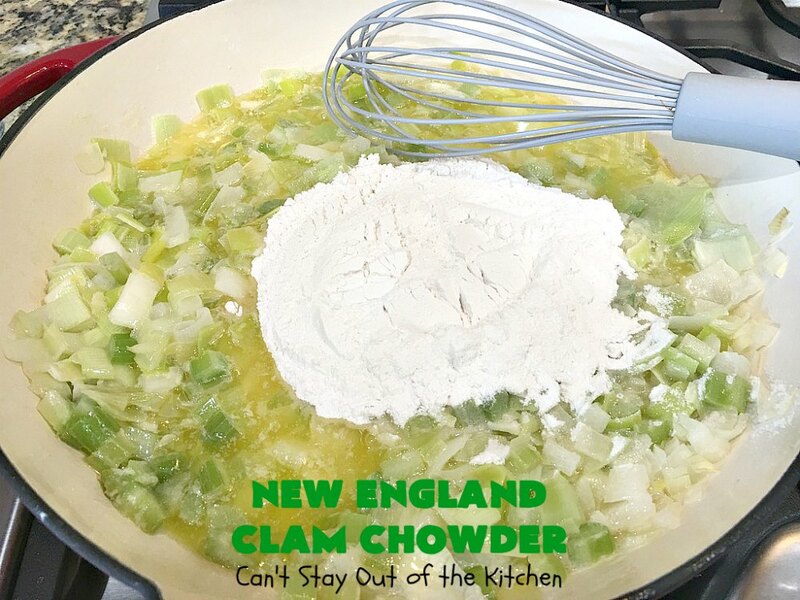 New England style is made with a cream base and does not use tomatoes. 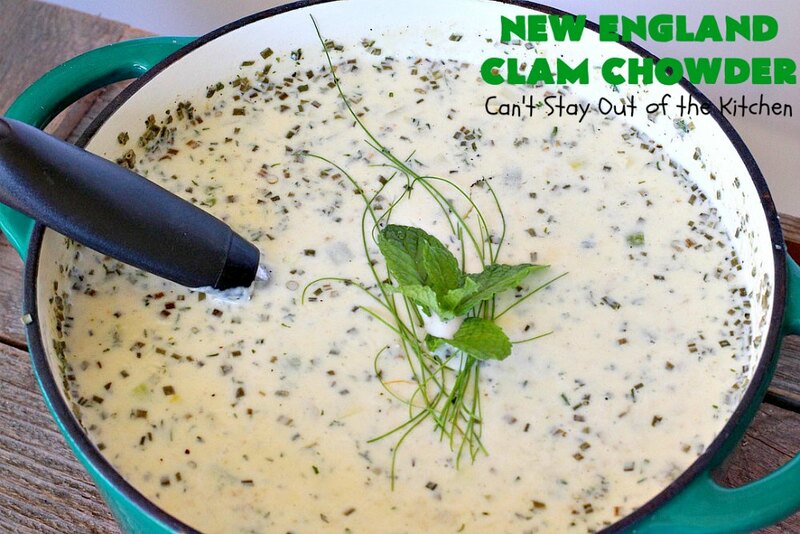 We’ve always preferred the New England-style Clam Chowder. 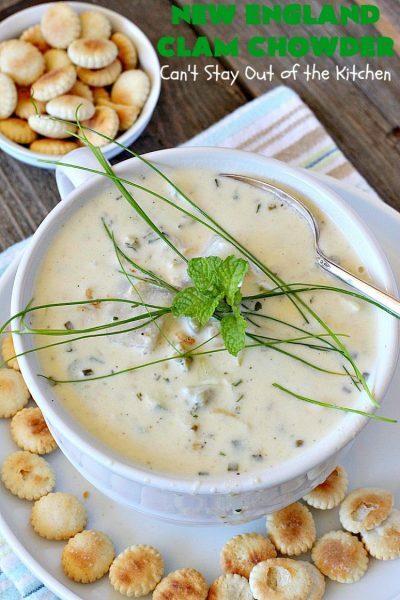 This sensational New England-style Clam Chowder is chocked full of minced clams, red potatoes, celery, leeks, shallots, and garlic in a rich, cream sauce seasoned to perfection. It's marvelous comfort food for fall and terrific for company dinners. Gluten free. In butter, sauté celery, leek, onion and garlic. Parboil potatoes in a small saucepan of water. This will probably take 10 minutes or less. Cook until potatoes are just barely done – not until they are mushy! Stir flour into veggie mixture, probably starting with about 1 cup. Add more if necessary to make the mixture almost to the dry point. Begin whisking in cream slowly and work into paste mixture. Whisk in half and half about 1/8 cup at a time until all is worked in and a sauce type texture is formed. Drain potatoes and add to sauce mixture. Sprinkle with parsley, chives, celery salt, Old Bay Seasoning and Mrs. Dash seasoning and stir in. Heat through, about 20 minutes or so. Check seasonings. Add more if necessary for your taste. NOTE: This will not turn out as well if you replace the cream and half-and-half with milk. The texture will break down while heating since there is not enough fat solids in 2% milk to hold their consistency. NOTE: To get the consistency and taste necessary, don't eliminate the leeks or Old Bay Seasoning. If necessary, go out and buy some to make this recipe! 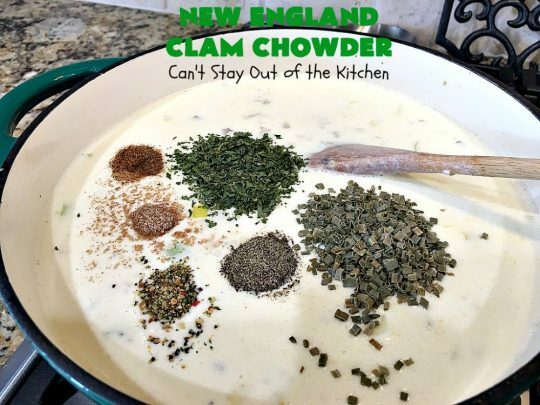 NOTE: We prefer this chowder very thick, but if you prefer it thinner, you can add more half-and-half or minced clam juice. NOTE: You need the equivalent of three cups minced clams. Don’t go just by the weight of the can. A 6.5-oz. can of minced clams yields about ½ cup minced clams and about ½ cup clam juice. A 10-oz. can whole clams yields about 1 cup minced clams. 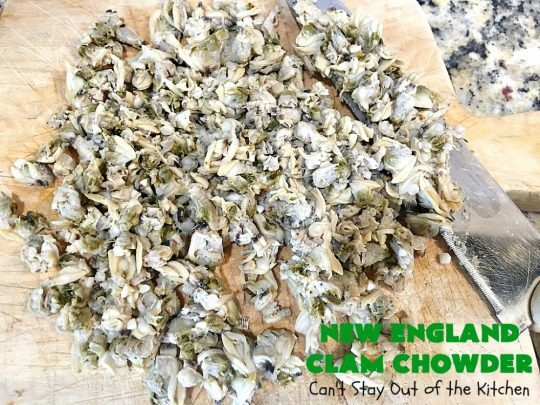 NOTE: Be sure to rinse and drain the clams well with water before adding to the stock pot. This sensational New England-style Clam Chowder is chocked full of minced clams, red potatoes, celery, leeks, shallots, and garlic in a rich, cream sauce seasoned to perfection. Gluten free. 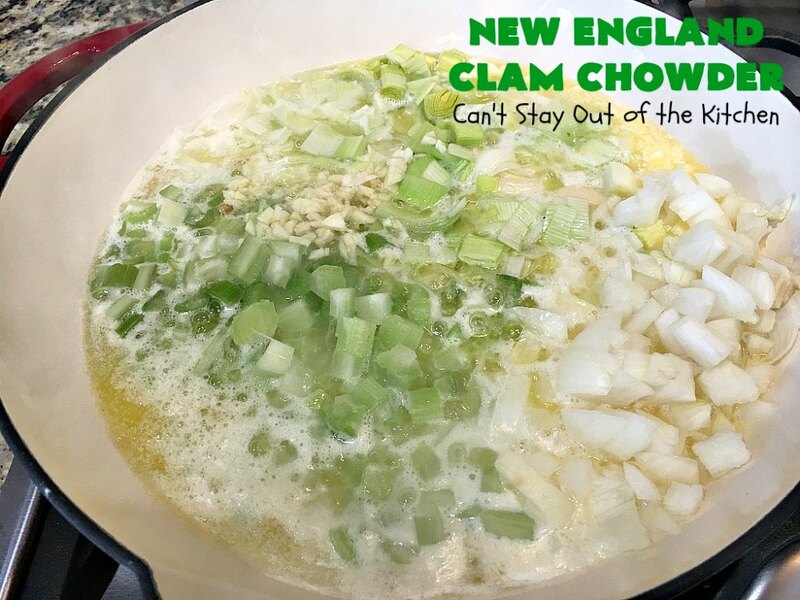 Cook until just barely done – not until they are mushy! Stir flour into butter mixture, probably starting with about 1 cup. 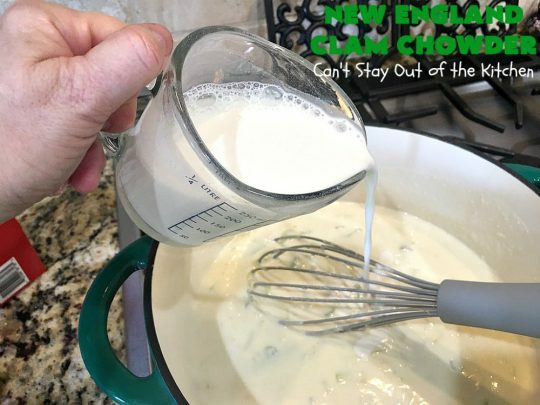 Whisk in half and half cream about 1/8 cup at a time until all is worked in and a sauce type texture is formed. This will not turn out as well if you replace the cream and half-and-half to milk. The texture will break down while heating since there is not enough fat solids in 2% milk to hold their consistency. New England Clam Chowder is a wonderful soup to serve company since it makes at least 12 servings. 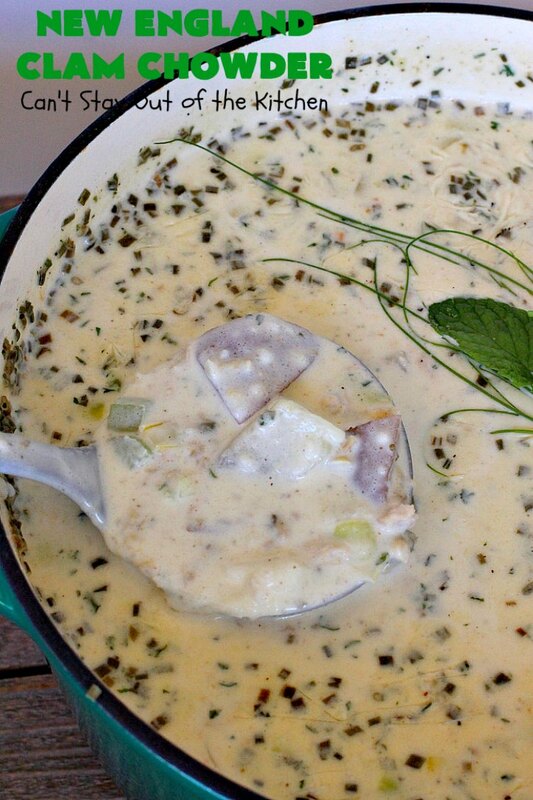 This chowder is so mouthwatering and delicious. 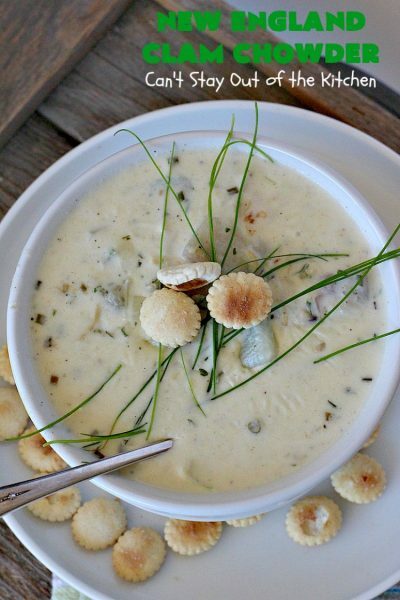 We love this thick Clam Chowder recipe and believe you will too. 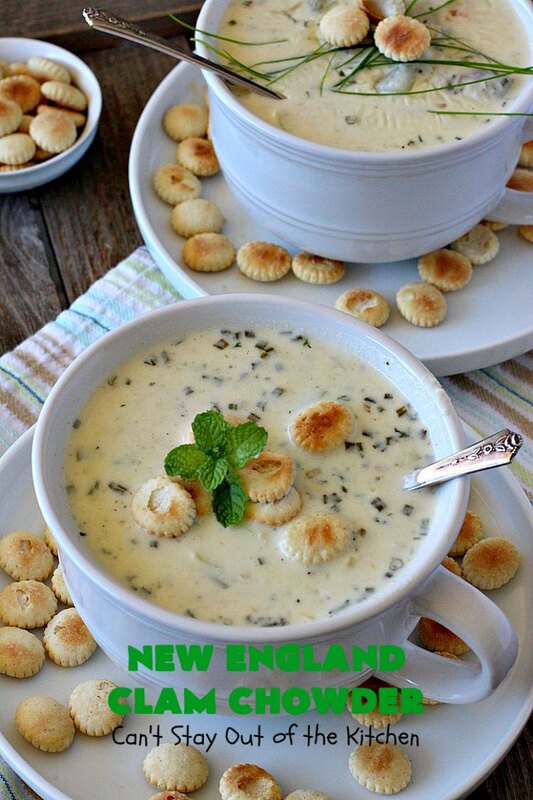 New England Clam Chowder is awesome comfort food! It’s certainly one of my favorite soup recipes for the winter and has been for decades!